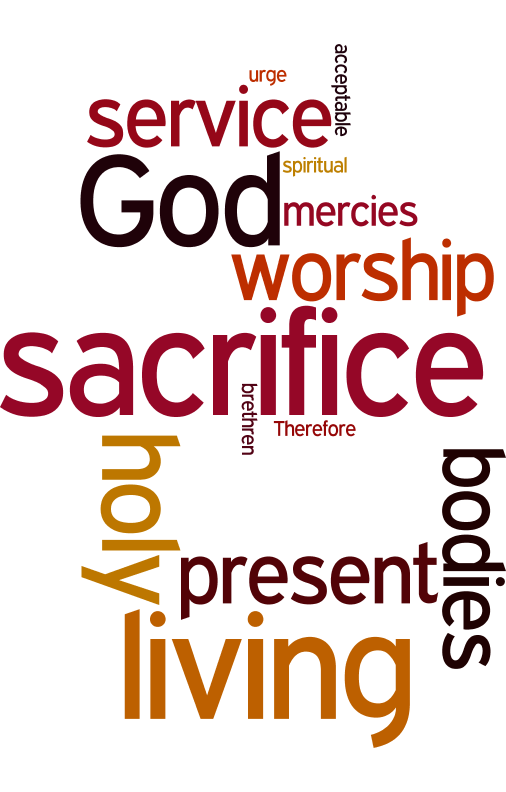 Paul writes to the Romans, I urge you, brethren, by the mercies of God, to present your bodies a living and holy sacrifice, acceptable to God, which is your spiritual service of worship (Rom 12:1). A living sacrifice is a prepared sacrifice. It will help us if we understand what was involved in offering a sacrifice in the Old Testament. When they sacrificed a lamb they prepared it in a certain way so that it was able to be received as an offering. It was the High Priest who prepared and arranged the sacrifice on the altar, and we know that Jesus is our Great High Priest (Heb 4:14). So now we come into the holy place within the heavenly tabernacle and present ourselves on the altar of incense to be a sweet-smelling aroma to God; we invite Jesus to prepare us as a sacrifice: we know what He is going to do, and we deliberately allow Him to do it. He slit its throat and drained its blood. If we are going to be prepared as a living sacrifice, we have to be willing to have our throat slit and our blood drained so that our life in the flesh is exchanged for His life in the spirit. Not literally, not physically having our throat slit, I hasten to add. But Jesus said, “You need to deny yourself, take up the cross daily, and follow me”. Lose our life, to gain His life. We are going to need to totally die to doing it our way, as a choice where we say, “I die to myself, I deny myself”, daily. The head was chopped off. We cannot be in charge, with our head. We have to be saying, like Jesus, “Not my will, but Yours be done”. He is the perfect sacrifice. He did this every day. He presented Himself morning by morning as a disciple (Is 50:4). I renounce the right to my free will. Every time, my flesh would get in the way and I would choose to do what suits me rather than what suits God. Therefore, not my will, but Yours be done: I am not going to let my head decide what I am going to do. The skin was removed. We cannot have defence mechanisms, protection mechanisms and our own self-righteousness as a barrier: we have to be vulnerable and transparent before God, and before others. We cannot protect ourselves: we must live in His protection. We have the armour of light, the armour of righteousness, and the armour of God to protect us. We do not have any of them if we try to protect ourselves with inferior armour of our own making. It is time to let it go. He split the body completely open, and washed all the inner parts. God wants our heart purified, refined and washed in the living water of His Word and His Presence. We have to be willing to open up our heart, open up our life. That’s what a living sacrifice is, it is saying “Everything belongs to You. I am not hiding anything from You. You have it all”. Finally, He chopped the legs off. We cannot walk our own way, we have to surrender daily and walk according to how the Spirit leads. “I am going to do nothing other than what I see the Father doing” (John 5:19). That is how Jesus did His miracles: He saw the Father doing it. He is calling us to do the same: miracles, signs and wonders, being led by the Spirit daily, following Him, not doing our own thing and going off in our own direction, but every day surrendering that day to God and saying, “God, this day belongs to You. This is Your day, I am just here as a servant. You lead me, You use me, empower me, envision me, show me what You are doing”. When we go to heaven and He gives us revelation there, when we spend time in our spirit, in communion and fellowship with Him; if we present ourselves as a living sacrifice, He will reveal Himself. He will use us if we give Him the opportunity. But we have to surrender and allow Jesus to prepare us to be the sacrifice, and we cannot offer it half-heartedly; because if we do, He knows.